Medium reminded me today that even the most boring and trivial interactions with your community can be a source of unexpected creativity and delight. 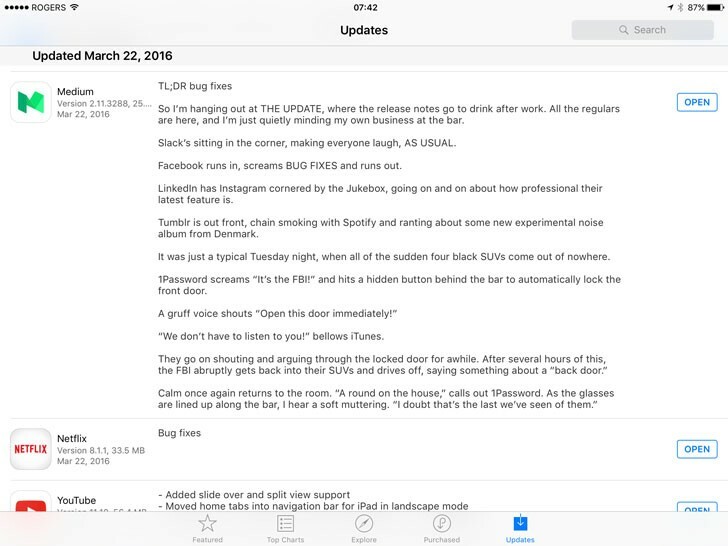 I’m used to seeing the same old same old boring “bug fixes” explanations of updates to iOS Apps. But when I checked the iOS App updates on my phone today, I saw this messages, which was anything but routine. And as I read it, not only did it bring a smile to my face, but it reminded my that Medium is a place for creative ideas and intelligent discussion. We all get used to things that are routine. They pass by as a blur in our day. They may be unremarkable or even irritating necessities. But they don’t have to be.